Jefferson County was one of 182 communities nationwide that participated in Arts & Economic Prosperity IV, a 2012 report released by Americans for the Arts. 2010 data collected by Create Birmingham from 99 nonprofit arts and cultural organizations demonstrated an economic impact of $235 million! If you’ll remember, 2010 was not exactly a banner year for national economic conditions, which makes the impact even more noteworthy. A couple of impressive numbers within the Big 235 total: (1) More than 4.9 million people attended events presented by those 99 organizations in 2010 and (2) Jefferson County’s cultural organizations really stepped up to the plate in their participation in this study. Our 80% participation rate was far ahead of the national average of 43.2. Thanks, comrades! 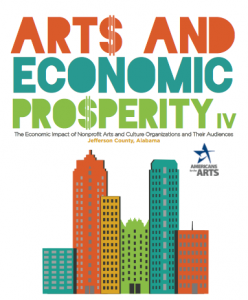 Arts & Economic Prosperity IV provides compelling evidence that the nonprofit arts and culture are a significant industry in Jefferson County—one that generates $234.9 million in total economic activity. This spending—$88.5 million by nonprofit arts and culture organizations and an additional $146.4 million in event-related spending by their audiences—supports 6,805 full-time equivalent jobs, generates $149.9 million in household income to local residents, and delivers $17.5 million in local and state government revenue. This economic impact study sends a strong signal that when we support the arts, we not only enhance our quality of life, but we also invest in Jefferson County’s economic well-being.The most comprehensive economic impact study of the nonprofit arts and culture industry ever conducted in the United States, Arts & Economic Prosperity IV was conducted by Americans for the Arts, the nation’s leading nonprofit organization for advancing the arts and arts education. Click here for a full copy of Americans for the Arts’ National Arts and Economic Prosperity IV Report.